Astrology is the study of patterns and relationships of planets in motion, our birth chart, synastry with others, the make-up of elements and using that knowledge as a tool to find meaning. Astrology is a long-established method of exploring ourselves, our relationships and our place within the world. 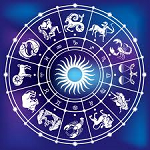 Astrology is the study of the influence that distant cosmic objects, usually stars and planets, have on human lives. The position of the sun, stars, moon and planets at the time of people's birth (not their conception) is said to shape their personality, affect their romantic relationships and predict their economic fortunes, among other divinations. Astrology is the method by which a total stranger (the astrologer) may detect how you tend to perceive the world, over time. Astrology had nothing to do with horoscope it goes far beyond your sun star. It is a positive useful resource to know who you are. Where you are going in the world? And what suits you? Astrology since the beginnings of society, humans have looked up to the stars as a source of inspiration and guidance. Over time ancient seers noticed and recorded correspondences between the movements of the heavenly bodies and the patterns of human life on the Earth.